Crested Serpent Eagles near homes – Is the ecology in danger? 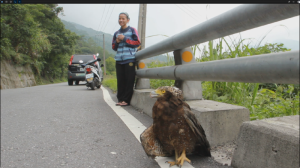 Near Xiama on The South Cross-Island Highway, the citizen journalist unexpectedly came across a Crested Serpent Eagle sitting on the road. The bird’s nonchalant demeanor and seeming indifference to bystanders was extremely surprising as this kind of bird normally fears man. The bird remained extremely laid-back, as the citizen journalist took close-range shots of the its magnificence. Everyone assumed the bird’s leg or wing was injured, however just as the local police officer informed his colleagues of his intention to capture the bird in a plastic bag the bird turned its gaze to the mountains and took to the air. The citizen journalist discovered that the bird’s manner in the air was just as it had been on the ground; cool, calm and collected, and as the police officer watched the bird soar into the distance he uttered, “ As long as it’s uninjured, I’m happy”. It is extremely strange that recently a number of these protected birds of prey have appeared on roads or around villager’s homes. Could it be possible that the recent Typhoon Nanmadol in Taiwan left these birds faint with hunger or is it that some ecological change has happened in the Hengshang area that has forced the birds to encroach on human’s living environment. It’s interesting to note that dust from the incident where a Black Bear was hit by a train has only recently begun to settle. We shouldn’t allow these incidents to be marks to commemorate 100 years of Taiwan, and need ecological specialists to thoroughly investigate the issue and come to a clear conclusion as to what exactly has occurred within the ecological system that has given rise to such a state of affairs.